More than 2,400 feet stomping to the unofficial rally cry of the school. Hearts pumping faster, howls growing louder. Adrenaline exploding, school spirit at an all-time high. The mass of the crowd vibrating the bleachers, pounding the floor, all of them in raucous synchronicity. The rest of the sold-out arena are on their feet, wishing they were part of the sea of school-color-sporting students. Looking around, you feel a connection to each and every person who belongs to those stomping feet and love this common thread that knits every person like stitches in your school’s collective fabric together. Okay, so not every school has a student section like Gonzaga’s Kennel. But I have to tell you, if your current college or a school of interest has a student section for sporting events, it’s worth looking into. Even if you weren’t spirited in high school, college is a completely new ball game. You may have only spectated at a football game or two during your time in K-12 education, but you might find yourself painting your face or buying a Morphsuit to cheer on your college team in person now! Many schools promote school spirit through free student entry or membership ticket sales, which in turn garner large crowds at sporting events. At my school, the Kennel Club is the biggest club on campus, and for a small fee at the beginning of the year, your school ID is activated so that entry to any sporting event on campus is free. You even get a free shirt to identify yourself as a club member. The more games you go to, the faster your membership pays for itself, and each one is a memory to soak in and keep forever. Being a part of a spirit club doesn’t require the same level of extracurricular involvement that academic clubs do, and they give you an unparalleled sense of belonging. Some sporting events will obviously draw larger crowds than others based on the success of the team, the location of the game, weather conditions (if applicable), and time of year (for academic conflicts). There will probably be more support for the sports that put the university in the headlines, such as basketball or football. These are the sports other organizations also tend to support, such as the dance team, pep band, and cheer squad. But the teams that attract smaller crowds also love the support of fans, so don’t be afraid to step out and show your love for one of the less popular sports. After all, you don’t look back at college and remember the times you stayed in your room and watched Netflix by yourself. In my second year as a member of Gonzaga’s Kennel Club, I can confidently tell you that some of my best memories have occurred in the McCarthey Athletic Center during basketball season. I can’t tell you how many hours have been spent outside of it too: curb-bumming for tickets for hours outside; shopping for red, white, and blue spirit gear; coordinating and sleeping in tents. The insanity of willingly camping outside in sub-freezing temperatures 200 yards away from your dorm may be hard to overlook, but the dedication to spirit is the overarching takeaway. Being a part of school tradition requires a certain level of craze and hoarse throats from cheering, but when you look back on your college life, I guarantee it’s what will put a smile on your face. Because it’s worth it. 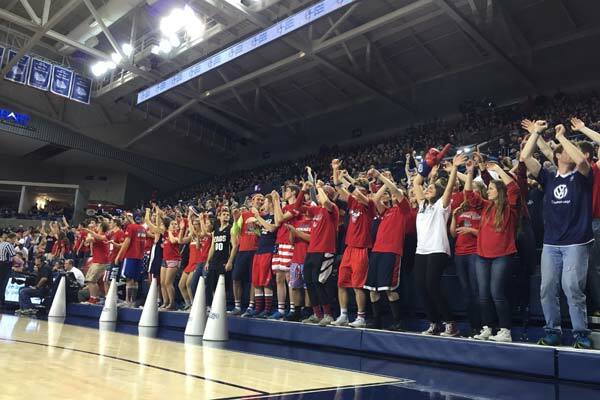 When I was weighing the pros and cons of each college during my final round of school selection, one of the attractive features about Gonzaga University was the supposedly wild spirit section. I saw photos of people with face paint, kids in absurd costumes, flags, and so many smiles. I watched a video of the Kennel doing what they do best: rallying energy through the coordinated Zombie Nation dance and each school color-clad kid looking like they were having the time of their lives. It seemed like the kind of fun that kids had in movies. I wanted it. I found myself a little less than a year later in the heart of the Kennel crowd, and those photos and videos were nothing compared to the real thing. 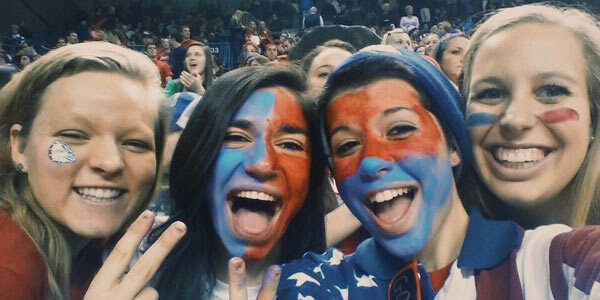 You’ll never find me with less than five spirit accessories on or without face paint at a basketball game. Do you know how exhilarating it was to be a freshman last year and almost see my team make the Final Four, or see our star basketball player break the school’s three-pointer record? It’s impossible to imagine what my college experience would be like without being in the spirit section at sports games. Everyone, in all the colleges out there, in all the student sections across the country, deserves those experiences. Silly as the Zombie Nation song may be, it draws goose bumps to the arms of every Zag who hears it. Because we know, as we draw our knees above our waists, and our bodies rise up off the ground, and we are all coming up and slamming our feet back down, as our arms are around the shoulders of the friends and strangers surrounding us, and as each voice shouts “WE ARE GU,” we are all Zags together. There is a feeling of infinity to it. It is more than school spirit. It is more than being at a basketball game. It’s not about the spirit gear capes and glitter, or the hours that we waited in the cold to be there, or even about supporting the basketball team at all. It truly is about unity and being part of something that was here before we were, and will continue to be here after we graduate. We can take as many selfies as we want to, pin up ticket stubs, save the cardboard signs that we painted on, record the ESPN games when we saw ourselves in the crowd. But nothing will ever override those moments in the student section when we were so overwhelmingly together.